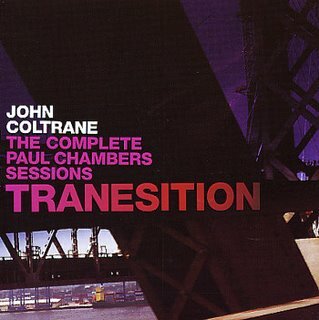 1956 was very early in Trane's career, but it can be regarded as the beginning of his search for an individual voice. Having been thrown out of Miles' quintet for his drug-fueled unreliability, Trane found work with other prominent musicians who couldn't resist jamming with a Miles Davis alumnus. Trane might have been the worst player in Miles' quintet, but that would still make him a very good tenorman indeed. Three sessions from 1956 are included on this CD They were recorded between Trane's two stays with Miles, and were essential parts of his development as a player. Running as a theme through these sessions is bass behemoth Paul Chambers, in a foreshadowing of the classic 'Blue Train' of the following year (in fact the first session on this reissue, from March 1956, also features Kenny Drew and Philly Joe Jones. Philly Joe also pops up on the April and September sessions). If you are familiar with that great record, then the music here will not be surprising - spirited hard bop performances, given additional colour on the September session by the presence of Kenny Burrell on guitar. The music contained in these sessions was originally released under Chambers' name, hence the 'Paul Chambers Sessions' tag. Session one is the pick of the record for me. 'Trane's Blues' kicks things off as a solid hard-bop blues with an instantly familiar theme that I can't just place... Trane is controlled and on inventive form throughout. He's not showy, with none of the searing intensity that would mark out his recordings later in the 1950s. The tune is pretty democratic too, with some nice playing from Chambers, in particular. 'Dexterity', the Charlie Parker tune, is taken at a much slower pace than Parker ever did it, this allows the band some room to breathe and they all stretch out in turn. Philly Joe is particularly good here. The April session suffers from poor audio quality, but is worth persevering with for the fantastic Curtis Fuller (another 'Blue Train' connection) on trombone. It's largely a blues set - 'Nixon, Dixon and Yates blues' being the track that really does it for me. Coltrane wasn't the only player to connect fully with the blues and turn it into an conduit for his soul, but on his day he could be one of the best. Fast forward to September, and things get a little more complicated with the polyrhythmic, latin influenced groove of 'Omicron'. Presumably this increase in rhythmic looseness was a direct result of Horace Silver's playing, and he can be heard prominently through the track. Donald Byrd is good too, in full-on Clifford Brown mode. The band really gel throughout the complicated opening and closing sections, and simply burn through the much more driving main part of the piece. 'Nita' sees Burrell join the ensemble with some well-considered lines that help to build the tension of this neatly constructed, driving piece of jazz. The final two tracks pale a little - they're both just run throughs of 'Nita' with different heads, basically, and add little to the album. Thanks to Gambit Records for rereleasing these sessions. They don't have a website so I can't tell you too much about their other releases. I own one other album of theirs, 'Hard Drivin' Jazz' under Cecil Taylor's name (also featuring Coltrane). Gambit has a lot of interesting stuff out... I picked up the Ornette Coleman Italian tour CD a while ago. Hadn't heard of this one, though... sounds good! The Jazzloft site has a media player with tracks from Gambit albums.